A couple of weeks ago, when I was in Brooklyn, I stepped into The Peppermill on 16th Avenue and saw that they were selling containers of donut mix! What could be easier than that? Add warm water, let rise 45 minutes and the donuts are a piece of cake ;). 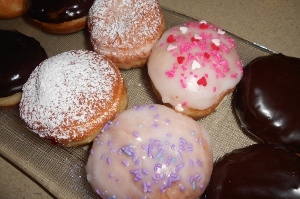 So today, when my daughter invited us for a Chanukah party, I offered to bring donuts! Of course, I was running late and decided to use the donut mix, but the finished dough looked so small, that I started to panic that there wouldn’t be enough (ever happen to you??) and put up a fresh dough of my favorite tried and true donut recipe as well. Well, the results of my made-from-scratch recipe were so outstanding that the donut-mix donuts were all left over! The dough mixes up in one bowl and it is a perfect consistency and yummy to work with. I have this recipe since I was newly married, and despite all the recipes I’ve tried over the years, this one kicks! Combine water, yeast and sugar in a mixing bowl till yeast is dissolved and starts to foam. 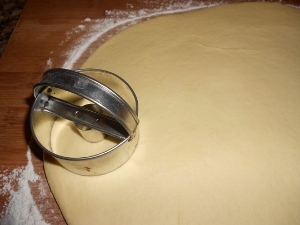 Add rest of ingredients and mix until the dough forms a ball and no longer sticks to the sides of the bowl. Rise 30-45 minutes until double in size. Roll out and shape with a round cookie cutter. Rise another half hour. Fry until brown on one side, then flip over and fry on the other side (about 30 seconds-1 minute on each side). While still warm, dip into confectionery sugar or regular sugar. 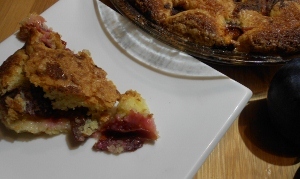 This recipe is not very sweet, so I like to fill (inject) it with raspberry jelly or custard. Topping it with poured fondant or chocolate glaze gives it a professional touch. We all love doughnuts, but oh, the work involved in making them: the (sometimes yeasted) dough, the rising, the shaping, and then the frying. For most of us it’s a once a year project prompted only by the family’s pleading and anticipation of these homemade treats. Now, what if you could have the flavor and texture of a doughnut without the frying? That caught my attention – was it possible? This is actually a muffin that tastes like a doughnut! 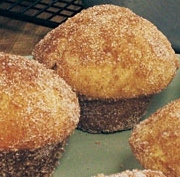 Aside from being much, much easier to make, these doughnut muffins are simply delicious. A creamed batter yields a light, cakey interior, while a dip in melted butter mimics the satisfying “fried-ness” of a doughnut. 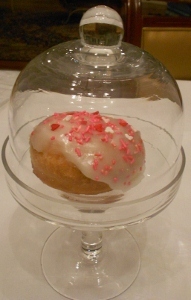 For some of us though, nothing but the real thing will do, so I am including a recipe for traditional “Sufganiyot”. Either one is sure to be a winner! 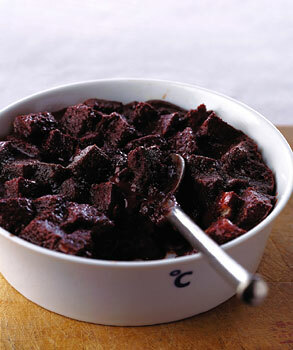 This recipe originates from Fine Cooking Magazine and is dairy. I would make it that way, but if you want, you may make substitutions for a parve muffin. 1. Put a rack in the middle of the oven and heat the oven to 350 degrees. In a stand mixer or a large bowl, cream the butter and sugar until it is light and fluffly. Beat in the eggs, one at a time, until just mixed in. 2. Sift together the flour, baking powder, baking soda, salt, and nutmeg, if using. 3. Combine the milk and buttermilk. 4. With a wooden spoon, mix a quarter of the dry ingredients into the butter mixture. Then mix in a third of the milk mixture. Continue mixing in the remaining dry and wet ingredients alternately, ending with the dry. Mix until well combined and smooth, but don’t overmix. 5. Grease and flour a standard-size muffin tin. Scoop enough batter into each tin so that the top of the batter is even with the rim of the cup about 1/2 cup. (a #16 standard ice-cream scoop gives you the perfect amount.) Bake the muffins until firm to the touch, 30 to 35 minutes. *to make your own buttermilk, place 1 tablespoon of white vinegar or lemon juice in a measuring cup. Add enough milk or parve milk to make 1 cup. Use as much as needed. 1. Dissolve the yeast in the water. Stir in 1-teaspoon sugar and let stand until foamy, 5 to 10 minutes. Blend in the milk, remaining sugar, butter, egg yolks, salt, nutmeg if using, and 2 cups flour. Beat in enough of the remaining flour to make a smooth, soft dough. Cover and let rise until double in bulk, about 1 1/2 hours. 2. Punch down the dough. Fold over and press together several times. Let stand for 10 minutes. Roll out the dough 1/4 inch thick. Cut out 2 1/2 -to 3 1/2-inch rounds. Place in a single layer on a lightly floured surface, cover, and let rise until double in bulk, about 1 hour. 3. Heat at least 2 inches of oil over medium heat to 375 degrees. 4. Using an oiled spatula, carefully lift the doughnuts and drop them topside down, into the oil. Fry 3 or 4 at a time without crowding the pan, turning once, until golden brown on all sides, about 1 1/2 minutes per side. The temperature of the oil should not drop below 350 degrees. Drain on a wire rack. 5. Place the jelly in a cookie press or a pastry bag fitted with a 1/4-inch hole or nozzle tip, Pierce one end of each doughnut with the tip and squeeze the filling until the doughnut is full. Roll the doughnuts in sugar. You may substitute whipped cream, pastry cream (custard), or pudding for the jelly. In Hungarian they’re called gesztenye (GES-ten-yeh), in Russian Kashtan, and in Flemish they similarly say kastanje (kas-TAN-yeh) for the delicacy we know as chestnuts. If you walk down a Manhattan street on a cold winter’s day, and get a whiff of freshly roasting chestnuts emanating from the corner street cart, you will be immediately warmed by at least 10 degrees. Although we refer to them as nuts, the meat inside a chestnut is soft and starchy, more akin to grains than crunchy-like traditional nuts. It is the only nut primarily treated as a vegetable due to its starch content. The chestnut’s flavor is an acquired taste, and not everyone appreciates their taste. Growing up, my mother served boiled chestnuts on winter Friday nights. It wasn’t until I was a little older that I started to like them, and now continue the tradition in my home. The versatile chestnut, cannot be eaten raw. The skins need to be sliced before baking or can be cooked in water without slitting. 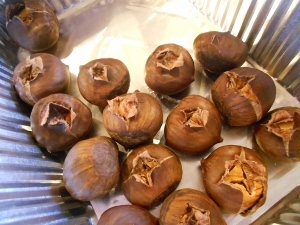 Cooked chestnuts are used in savory soups and stuffings, as well as in sweet desserts. Harvested from October through March, December is the prime month for fresh chestnuts. Choose fresh nuts that are smooth and glossy, free of blemishes. They should feel heavy for their size. Avoid any that are shriveled, cracked, or rattle in their shell. I usually squeeze the nut between my fingers and if the shell doesn’t indent, I know they’re fresh. Today, kosher chestnuts are sold cooked and peeled in a foil bag, making it easy to use in recipes and even just to snack on. 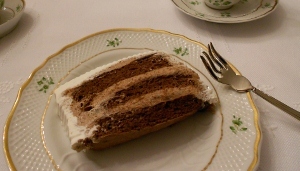 This delectable cake is a Hungarian specialty. If you know where to find kosher chestnut puree, you can use it for the filling, and please be so kind as to let me know where I can get it. 2. 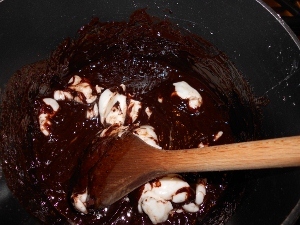 In a separate bowl, combine egg yolks, cocoa and baking powder. 3. Fold 1/3 of the whites into the yolk mixture. Sprinkle with all the flour. Fold in the the rest of the whites in 2 additions. 4. Pour into parchment lined 10×15-inch cookie sheet. Bake for 15 minutes or until cake bounces back when gently pressed with a finger. 5. 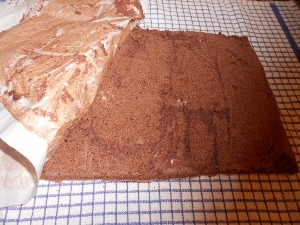 Remove cake from oven and invert onto a clean towel. 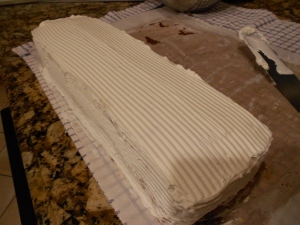 Gently peel back the parchment paper, using a knife to separate the cake from the paper, if necessary. Cover and cool cake. 1. In a small pot over a medium flame, cook the eggs and sugar, mixing the whole time, until smooth. Add the cocoa and chocolate, mix until melted and smooth. 2. Remove from flame. Add the Shortening, mix until melted. Add the whiskey if desired. Cool. 1 stick margarine, room temp. 1. 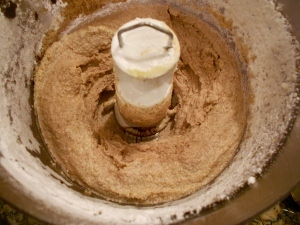 Process chestnuts in the food processor with the S blade until smooth. Add the margarine, 3 cups of confectionery sugar, vanilla sugar, and chocolate cream. Taste to see if it needs more sugar. Add accordingly. 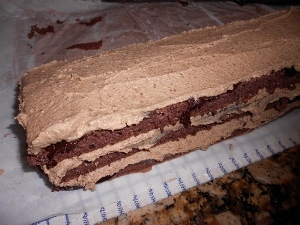 Smear the chocolate cream on the jelly roll cake. 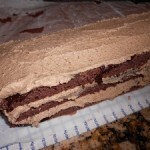 Top with most or all of the chestnut cream. 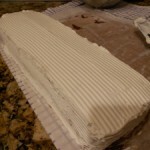 Cut the cake into 3 strips lengthwise. 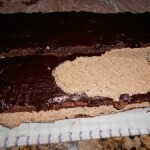 Put one strip on top of the other until all the layers are stacked into one cake. Cover with whip topping and decorate any way you like. 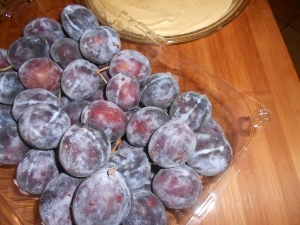 Plums are one of the few fruits that are better eaten cooked than raw, since cooking enhances their sweetness. This recipe was printed many years ago in the NY Times. My friend has the original copy and has been making it for years. 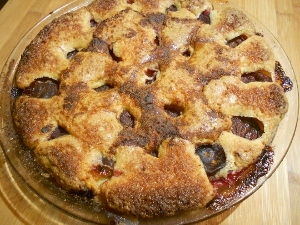 Yesterday, when I saw a box of Italian plums beckoning in Costco, it reminded me of these delicious pies. Aside from its’ good old-fashioned taste, it is also easy to prepare. The recipe calls for a springform pan, but will work well with a 9-inch pyrex pie plate or a disposable pan. Sugar and cinnamon for topping. 3. Spoon the batter into a spring form of 8, 9 or 10 inches. 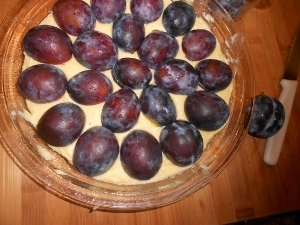 Place the plum halves skin side up on top of the batter. Sprinkle lightly with lemon juice, and (up to 2 tablespoons of) sugar, depending on the sweetness of the fruit. Sprinkle with about 1/2-1 teaspoon of cinnamon, or to taste. 4. Bake for 40 to 50 minutes. Remove and cool; refrigerate or freeze if desired (but first, double-wrap the tortes in foil, place in a plastic bag, and seal). Or cool to lukewarm, and serve. 5. 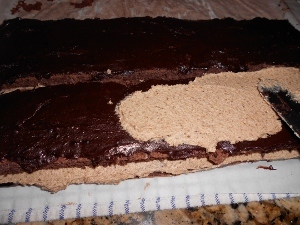 To serve a torte that has been frozen, defrost and reheat it briefly at 300 degrees. How many times have you ripped out a recipe from a magazine in the hopes of making it sometime soon? I have loose-leafs of such papers, all neatly arranged in plastic protector sheets. Every so often, I will look through them, and some recipe’s day will come that I try out the new creation. This particular recipe is from the Feb 2005 issue of Gourmet magazine, and I probably made it for the first time 2 or 3 years ago. 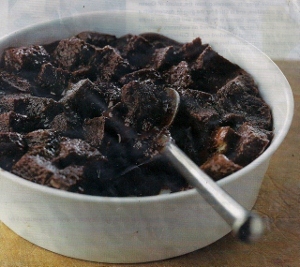 It is a most outstanding dessert in the sense that it has the richness of dark chocolate, the creaminess of a custardy bread pudding, and the spiciness that just tantalizes the taste buds. If you love all those things, this dessert is for you. Just one warning; it is for the sophisticated palate. Please Note: I am not sure why, but this recipe serves 1. Multiply the ingredients for as many as you’d like to make. 1. Put oven rack in middle position and preheat oven to 350 degrees. Generously butter an 8 oz ramekin or a muffin tin. 2. Cook butter, cream, chocolate, sugar, vanilla, cinnamon, cayenne, and a pinch of salt in a 1-1 1/2-quart heavy saucepan over low heat, stirring constantly, until chocolate is melted and mixture is smooth, 1 to2 minutes. Remove from heat and whisk in egg until combined. Fold in bread cubes and let stand 5 minutes. 3. 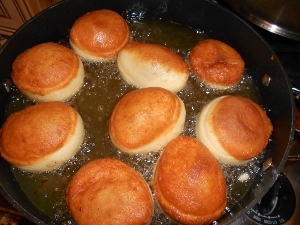 Fill ramekin with bread mixture and bake until puffed and set around edge but still moist in center, 15 to 20 minutes. Cool 5 minutes before serving. Top with ice cream or serve alongside.